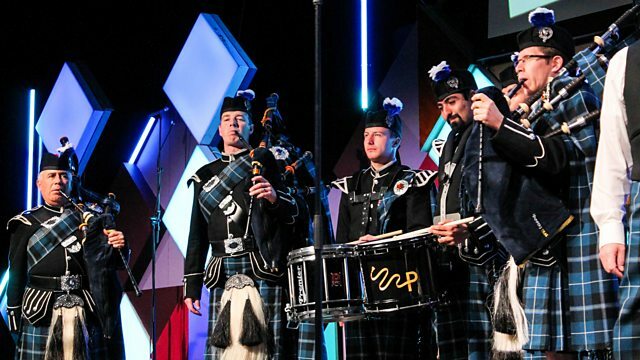 Janice Forsyth and ABC's Sonya Feldhoff co-present a special show from the heart of the Edinburgh Festivals with members of The Royal Edinburgh Military Tattoo and special guests. A troop from The Royal Military Tattoo open both hours of the show with pipes and drums and that traditionally Scottish sound. Brigadier David Allfrey tells us what it takes to put the show together. Apphia Campbell performs an extract from WOKE and joins Janice and Sonya on the sofa to talk about what inspired her to write a one woman show about activists more than forty years apart protesting with the Black Panthers and at the Ferguson rallies. Roddy Bottum of Faith No More talks about his opera at the Edinburgh Fringe Festival - Sasquatch, and we have a performance from it. We have music from Scott Hutchison, poetry from Michael Pedersen, and they talk about collaborating together on Oyster - a book of poems from Michael and illustrations from Scott. MJ McCarthy plays a record especially chosen from his show Turntable, and joins the sofa to talk to Janice, Sonya, Scott and Michael about music and storytelling.